We are a nation driven by technology, and digital marketing has a massive impact on people’s purchases and life habits. Companies today need a solid grasp on how to utilize the digital universe to maximize their brand awareness and impact. We’re going to look at some of the most significant ways that digital marketing has evolved and keeps evolving the way businesses and brands operate. Marketing has been around for as long as humans have had something to sell. Until recently, marketing has changed very little over the ages. For the majority of human history, marketing was the simple act of persuasion. Now, all of that is changing as we evolve into the digital age. The earliest sign of the shift happened back when billboard, television, and radio marketing erupted onto the scene. This new technology made it possible to reach far more people. The goal was no longer to persuade a well-known, small audience; with the help of traditional advertising, marketers could suddenly reach thousands. Then, the internet happened. The internet marks the most significant change in marketing the world has ever seen. We now have immediate access to more people than ever before. Numbers have increased as reach has been simplified – thousands transformed into millions, and the potential for finding buyers has grown exponentially. Along with the growth in marketing, the amount of competition has drastically increased. In this digital age, old marketing tactics are no longer as effective, and companies must be more resourceful and innovative than ever before to stay ahead of the competition. WiFi and smartphones have revolutionized how individuals communicate and access information, so it’s crucial that marketers make use of these devices to keep up with the ever-changing face of audience interaction. Few people leave home without their devices, so it makes sense that companies utilize these devices in their marketing strategies. One of the biggest utilizations of these new devices is social media. The use of social media means that target audiences are now actively encouraged to engage with brands and their marketing activities while doing something they love – interacting with their community online. With millions of people active on social media, it’s a great, easy and inexpensive platform to grow your business. The digital age has brought significant changes to the way marketing is approached. In many ways, this works to your advantage. There’s more opportunity than ever before. If a brand wants to be successful now and in the foreseeable future, they need to keep up and invest in the evolving technology and social platforms available. Brands that can embrace and adapt to this transition will rise above their competitors and stay afloat in the digital age. 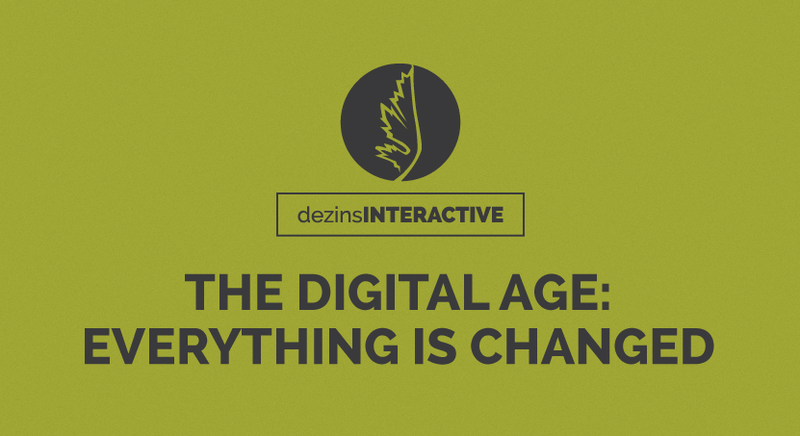 If you’d like more information about digital marketing, email info@dezinsinteractive.com.